Join author Kristi Charish as she gets ready for New York Comic Con! 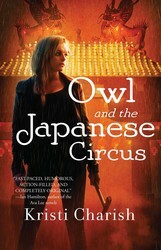 My debut novel, Owl and the Japanese Circus, about an archaeology graduate student turned international antiquities thief, who despite her best efforts can’t escape the supernatural underworld, came out in January, and now the second book in the series, Owl and the City of Angels, came out this past Monday (Oct 5th) as I was writing this post. It is kind of crazy–I’ve gone from scientist, to aspiring writer, to debut writer, to sophomore author with seven books under contract. All in the span of two years. At the very least it’s been a wild ride. And new things–so many new things, including getting ready for NYCC this week! As excited as I am, I won’t lie: there have been some panic-inducing moments along the way. 9:00 am (PST): Have hotel, have flights booked, have passport not expired yet… Check Facebook (first mistake). See that other authors I follow who are going to Comic Con have posted pictures of their panelist badges decorated with The Walking Dead… pre-coffee brain starts to churn. I don’t have a badge yet…Should I be getting a badge? 9:20 am (PST): Post coffee, go to NYCC website and determine that: A) All Panelists who are getting badges should have them by Oct 1st, and B) to get a badge you have to be registered by the 4th of September. No badge, no entry. Period. 10:00am (PST): Run downstairs to check mail. No badge is wedged inside. Early panic sets in… Was I supposed to register myself? Did my publisher? What happens if I don’t have a badge?? 10:10am (PST): Begin to draft email to my editor inquiring about whether I missed registering myself. 10:30 am (PST): Takes twenty minutes to edit out the panicked parts. Send email and go back to packing, all the while trying to come up with ways to infiltrate the Con without a panelist badge… maybe I can convince someone in security to walk me to my event??? Beg another panelist to borrow their badge?? 10:00 am (PST): Hopefully check mail, closing my eyes as I open the box. No badge. 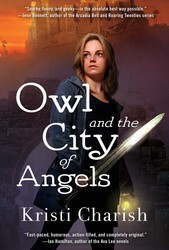 The wild second adventure for unforgettable antiquities thief Owl—a modern-day “Indiana Jane” who reluctantly navigates the hidden supernatural world—from the pen of rising urban fantasy star Kristi Charish.